Our “real-life” costumes from last year. Maria Montessori found that children up to age 6 need a very strong foundation in reality. They absorb their environment as a way to understand the world, and when fantasy and fairy tales are introduced too early, children can become confused about what is ‘real’. My family went to Disneyland a few weeks ago and my 3 year old demonstrated this for me. When we were on the ride It’s a Small World, my daughter asked “are those people real or pretend?” This question was repeated on almost every ride. As adults, we know the difference and enjoy the fantasy as an escape from the real world. However, to a child under 6 years of age, everything is real as they try to make sense of our world. As we head into Halloween this week, consider this when your children pick their costumes. 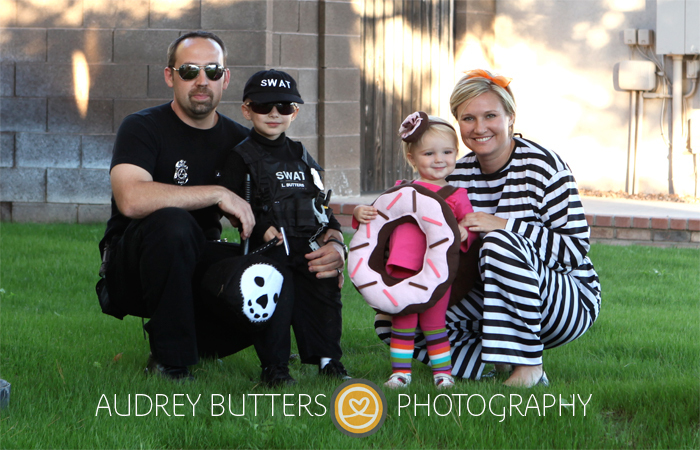 Real life costumes such as a mailman, doctor, police officer and veterinarian help your child relate to the real world. Too late this year? This can also be applied to your dress-up bin for your children. In fact, after Halloween is a great time to stock up on dress-up outfits! I like Lakeshore Learning for high quality, real-life costumes. Some Montessori schools do “Historical Halloween” where each child chooses to study a real-life historical figure. On Halloween, the child dresses as that historical figure and gives a presentation about what they learned about that person. Other schools, especially classes with children 6 years old and under, prefer to maintain the routine of the classroom and leave Halloween celebrations for home. These classroom may focus on real-life aspects of Halloween, such as parts of a pumpkin, parts of a bat, or naming the bones of a skeleton. Inspired by this post on the blog Living Montessori Now, I wanted to touch on grace and courtesy lessons for Halloween. Have you considered what a great opportunity Halloween provides to practice patience and manners? As with anything Montessori, modeling and practicing the desired manners is the most successful way to demonstrate them to your child. Verbally telling them all of the rules will just bore them (and probably you!). You can role play with your child to practice – be prepared for lots of repetition…this is fun! Have your child observe you as you trick or treat – you can ask a neighbor, sibling, other parent or friend to hand out candy. The first time or two, your child can walk with you while you model appropriate trick or treating. Here are some of the manners our family uses for trick-or-treating. Now it’s your child’s turn to try. After practicing a few times, switch roles – it’s fun for the children to pretend they are adults! After they have had a lot of practice, you can make it more fun by “making mistakes” and breaking the rules. Your child will probably correct you, or you can laugh at your own mistake and correct yourself, saying “Oops, I’m not supposed to walk on the grass!” We all make mistakes, and it’s good to model how to recover from mistakes too. Hold a hand to cross the street. Its a short and catchy song to help your kids remember the safety rules. Have a safe and Happy Halloween!